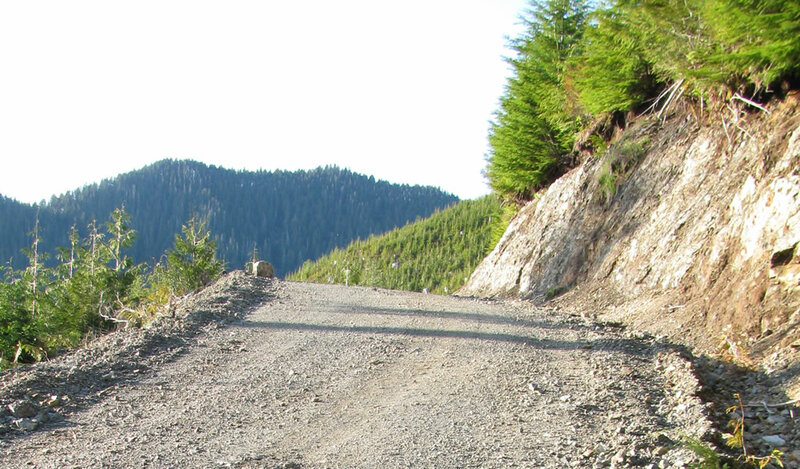 It’s a relatively short drive of only 2.5 hours along some of Vancouver Islands extensive network of gravel logging roads until we reach the far west coast of the Island and one of our favorite areas for hunting Black Bears. In the month of May it can be a hot, dusty drive as logging trucks and crew trucks zip by you sometimes adding an extra hour or two to the trip because of the dust clouds they kick up, stretching for hundreds of meters, and limiting your visibility to near zero. Some of the “Off-Road” logging trucks that haul logs along these roads, probably wouldn’t even notice my little F-150 if they drove right over us, so needless to say if it’s hot and dry you’re in for a slow trip! Thankfully for me there had just been a nice light rain for a few hours and the roads were still damp which kept the dust level down. I arrived to our chosen spot in good time, only to find the rest of my group had not arrived yet… So I proceeded to setup camp which consisted of a 14×14 eena tent, our wood stove, and a couple of cots. I quicky unloaded the quad, and then sat for a little while waiting for the rest of the crew to show up. The spot we’ve been camping at the last few years is a beautiful spot in the valley bottom where two small rivers meet together and there is a small landing big enough for a couple trucks and a large tent. It’s nestled right in the middle of prime Black Bear country and it’s always been a good spot for us to go. About an hour and a half after I arrived the rest of the party finally showed up, and after some quick unloading and getting ready we took off to catch the evening prime time. On a hot spring day it’s pretty much a guarantee you’re going to find bears from the hours of 3pm till dark, as the evening rolls in and cools off the hillsides they seem to come out in full force. A few minute quad ride from camp and up one of the nearby spurs we’d already spotted our first bear meandering through a clear cut about 1/4 mile away, but it was into the timber quicker than we could get our spotter out to see what it was. The first evening was pretty uneventful as far as bear hunting goes with only the one sighting, before turning into camp just before dark to cook supper and have a few pops. The next morning (Friday) saw us rise out of bed as early as most spring bear hunters, so sometime between 8am and noon we were up and ready to go. It was shaping up to be a hot, clear day so as usual we got serious about bears around 3 o’clock in the afternoon, and headed off on the quads in search of a bear with a good hide (a challenge for this late in the season). Once again it wasn’t long before we’d found a bear, upon closer inspection it turned out to be a good sized sow, with a couple of cubs stashed up in a cedar tree. We watched her watching us for a little while and then moved on into another area we’d been planning on checking out. Our next stop was way up in a very high valley, that is sort of secluded from your view down below. It had always been a good area for bears over the years so we proceeded to check it out. We arrived to one of the big landings near the top where you have a really good view of the valley and surrounding cuts and started to glass. After a few good minutes of glassing we decided to continue on up a little spur that was recently punched in for the loggers to start hauling trees from a new area. The road sort of side hilled the high valley and skirted the top edge of the mountain, surrounded by 2 and 3 year old cuts, that were starting to really green up, with lots of good feed around for bears. As we rounded the last steep corner on the spur, we could immediately see two decent sized bears running down the road, obviously startled by the two quads that had just come upon them, so we backed off and let them run up the road a little ways while we glassed them a little more to determine which one was the boar. The bears are starting to rut in late May, early June so it’s not uncommon to find them in a pair like this. The boar will usually appear quite a bit larger than the sow they are travelling with, which can make identification a little easier and this pair was no exception. They both had beautiful capes for late spring bears with very little rubbing and the sow even had a pie plate sized white patch on her chest, the boar had a small white throat patch. A BIG Thanks To Sitka Gear for their renewed advertising on our website. 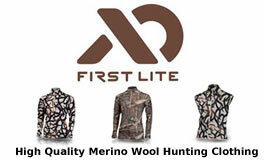 The “Open Country” camo pattern they offer is bar none one of the best patterns you can get for hunting a wide variety of terrain in BC. In the case of this bear I was able to sneak along the road, and lay down in the gravel where I was just another pile of rocks to the bears. As you can see in the video below, these bears had no idea I was laying so close! From the mountains chasing sheep, to the clear cuts of the Island chasing bears and everything in between, this really is a great pattern. After a few quick minutes of study as the bears were walking away down the road we determined the boar was now in the lead, and if we were to get him, we’d better get the lead out and put a stalk on… Since I was the shooter, I quickly got my gun ready and handed off the new HD video camera to my buddy with no instructions on how to use it and told him to get a good video of the stalk and shot. He eagerly obliged! The two bears were now quartering away from me, and slowly walking down the road away from the quads. I quickly closed the distance on a crouched over fast walk, keeping a few trees and some brush between myself and the bears line of sight… As I got closer, I could see BOTH bears had now turned around and were in fact coming right back towards me, I had to act quickly or would get caught in the open as they rounded the corner. I quickly manouvered to a little rock/dirt mound on the edge of the road, and could see the first bear, but it looked like the sow… The bears had switched positions on me again. A few quick hand signals with the guys behind me, verified what I was seeing, so I slowly crawled into position onto a little dirt mound and waited patiently for the bears to come closer. I had lots of time to line up and get comfortable for a good shot so when the boar reached the corner of the road, and gave me a good broadside I held a bead on his front shoulder and let fly. He was hit hard, and immediately went into a spin to try and bite whatever had just stung him, and I quickly jacked another shell in the chamber, and waited for the bear to make his next move, he pulled out of his spin and headed straight up a dirt bank and I sent another one into the back of his neck immediately killing the bear and he rolled down the hill and into the ditch. It was all over and now the real work was about to begin. Many hands makes for light work and we had the bear skinned, quartered and ready to pack out within about an hour. Once we got back to camp the bear was stretch out hair down next to the flowing creek where the air was quite cool. I skinned out the face, turned the ears, lips and nose and proceeded to work on the paws until I ran out of scalpal blades. During the day we kept the hide cool by digging a 3’x3′ hole in the shade and placing the folded up hide inside which helped keep it cool during the hot spring days, at night it was brought out and stretched again. The bear was killed on Friday evening, and was in the taxidermists that monday morning without any hint of hair slippage so our care of the hide worked out perfect. Another end to a great weekend of Black Bear hunting on Vancouver Island! 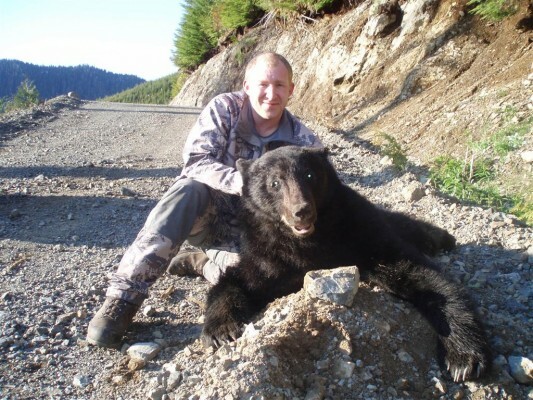 If you have any questions or comments about this Black Bear hunt please let us know in the comments section below and we’d be happy to answer you. Thats a beautiful bear. It would be great to see the finished product after the taxidermists have finished with it. Sounds like you had a ball. Great job on the right up Carl and thanks for helping to get us all out for another great weekend in the bush . No problem, it was good times! Thanks again for the awesome weekend Carl , what a great experience. No problem! You’ll have to come again next year. I have been hunting on the island for a few years now and when I bear hunt it usually consists of day trips with a butcher not more then an hour or two away. So when I got a bear last Oct we just skinned it and took it to the butcher and called it a day. However I plan to do some weekend trips this coming fall season for bear/mule deer. What do you do to keep the meat from spoilng? Hang it in Camp? We can get some hot days in Oct/Nov just wondering what my options would be for deer or bear that wouldnt make it to the butchers for a few days? For a weekend trip you should have no problem. Get the hide off immediately and get the meat cooled down. Then hang. Pepper sprinkled and rubbed on the outer skin of the meat will prevent flys from getting into it. During the day when it’s warm take the meat down and place it in the shade somewhere. We dig a pit and then lay the meat down in the pit because it’s always a few degrees cooler below ground. Oct/Nov I’ve let my deer hang for 4-5 days on the Island with no troubles. I would also phone your butcher before the trip and tell him/her to expect you if you are successful. Good luck in the field and keep up the great work with your awesome website. No problem! Have a great season! Being from Texas you’d need to hire a licensed Guide/Outfitter if you came up here. Yes, bow hunting would be an option, I’ve been within bow range of plenty of good Boars and any competent bear guide up here shouldn’t have a problem. 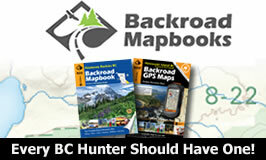 Start searching for Vancouver Island Black Bear Guides and you’ll find a few prominent outfits. It’s easy to get transportation to the Island from Texas whether you drive/fly. 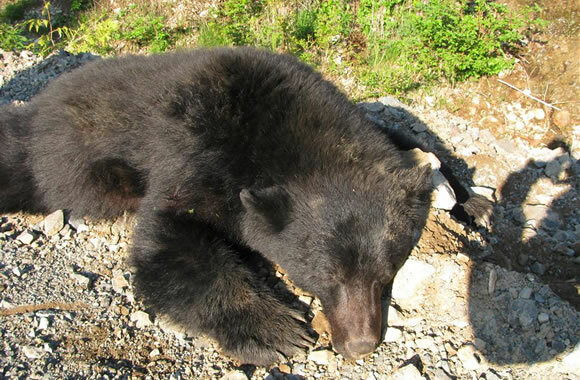 The best hunting for Black Bears will be the hunts on the Northern end of the Island. 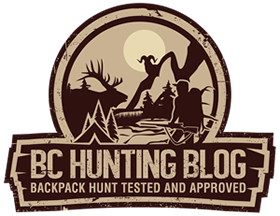 great post, I am a local islander as well (grew up in nanaimo) and I spend a lot of time hunting horne lake, and the shotgun area behind parksville area. What calibre/grain bullet do you use for bears on the island? Thanks for your comment. I’ve taken Black Bears with both my 7mm with 170 grain and my .270 using 130 grain. Good luck to you this year! Do spring black bears have a good hide? Hi Jerry, Yes, they do if you can get to them fairly early in the season (april/early may). However, if you want to see the most bears may is probably the best month. If you have a guide they’ll be able to help you choose a bear that still has a decent hide.